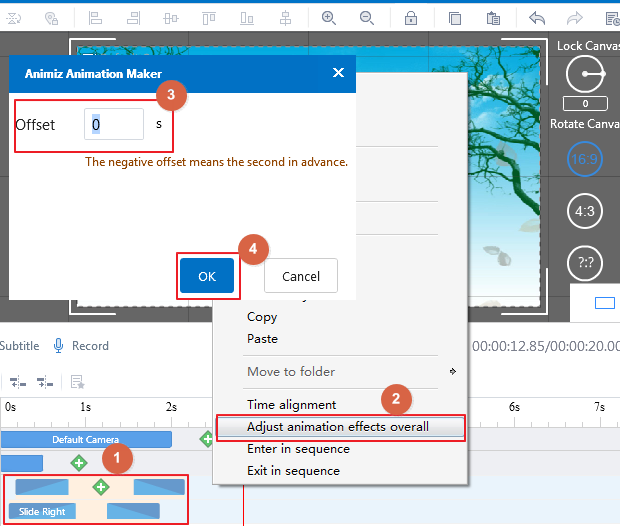 Animiz Animation Maker brings users with the chance to adjust animation one by one or overall. If you want to adjust animation effects overall, it is also very easy. There are two ways to let you finish the operation. 1. Click the exit animation bar and hold the “Shift” key to select your target animation bars, and then click the “Adjust animation effects overall” icon . There will be a small popup window, and you can go ahead to set the offset (The offset can be negative), so that you can adjust all the selected animation effects overall. 2. Put the mouse on the selected animation bars, and click the right mouse button, and then select the “Adjust animation effects overall”option to customize the offset directly. Previous：How to align objects’ entrance/exit effect? Next： How to make animation effects enter/exit in sequence?